Justice League paved the way for Darkseid to make his cinematic debut, but now that a sequel seems unlikely to happen any time soon, I am wondering where we may see him. Ava DuVernay's New Gods would make sense, but it has already been revealed that the villains in that film will be Granny Goodness and her Female Furies. Still, how can you have a movie set on Apokolips without including Darkseid? Maybe we will hear word of his inclusion as production moves forward. Maybe he's stuck on the Promethean Wall ["again"]? Look at this way, Ross. It wasn't exactly "any time soon" that we next saw Thanos on the silver screen after that measly two-second cameo at the very end of the first Marvel Avengers flick. But, it still eventually happened, regardless! So, don't give up hope for a JLA sequel within the next five years, at least. I'm sure the New Gods set production department will sneak in at least a statue or a "Work for Granny! Die for Darkseid!" poster with his ugly mug on it. Of course there will have to be at least a reference to Darkseid in the New Gods film, and I think it likely that he'll at least cameo in a post-credits scene, having manipulated events (Granny does serve him, after all). And, there's been some confirmation that a Justice League sequel is probable; at any rate, Warner Brothers is keeping it live. It may be a while, given the production delays on things like Wonder Woman 1984 and the Flash movie (which has gone back and forth on whether it's going to be Flashpoint), but unless something goes seriously off the rails, it'll be there. An amalgamation of Pop Tate & Darkseid PopSeid in Popseid's ApoCKoLit Shop. @Brother Kellymatthew Barnes:What about Mr. (not Mrs.) T's pierogies (pity the fool that doesn't try those pierogies).LOL; also a tale of Tennessee Tuxedo thinking he got a babysitting job in Azabu-Juuban, Japan when someone offers him a job supervising a group of "chicks' and finds out the "chicks" are sailor Moon and the Sailor Scout; it could be called "Tennessee Tuxedo Mask (Kamen). Anonymous Better Mr T's pierogies than Nancy Pelosi's. In conclusion Tennessee Tuxedo Must Not fail. When I look at this cover I "hear" the "Everything's Archie" music in "the windmills" of my mind. Well, not everything was Archie. I remember having fun just "Monkee-ing" around! @Cary Comic I'm not even 60 yet. I only saw those as syndicated shows in the early morning. @Cary Comic 21 is the new vermilion. "One vermillion, two vermillion, three vermillion, four! Five vermillion, six vermillion, seven vermillion, more!" @Cary Comics it really is. "Acha-Cha-Chada-Cha." - Jimmy Durante. @Anonymous in conclusion "Na-Na Na na-Na-Na NA!" - The BaNaNa SpLiTS GaNg. Is half your heart in Havana-na-na-na-na? I'm sorry @Anonymous I have no knowledge of that and so I can't play with it at all. Well I'm honest about it. The debut crossover hit for some Latina singer named "Caramello" (or something like that). 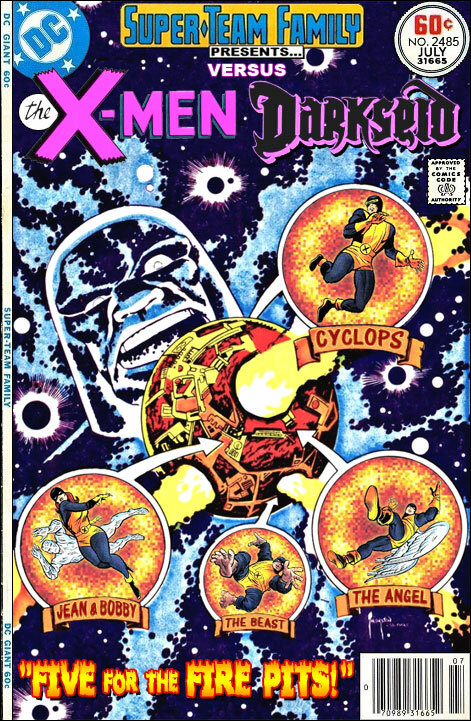 Didn't the X-Men actually face Darkseid in the 1982 X-Men/Teen Titans crossover? Never trust a pop vocalist named after a 3rd tier candy bar.